Remember in Tracing the Lemon’s from Columbia to Greenville to Charleston Using City Directories I found Rev. R. I. 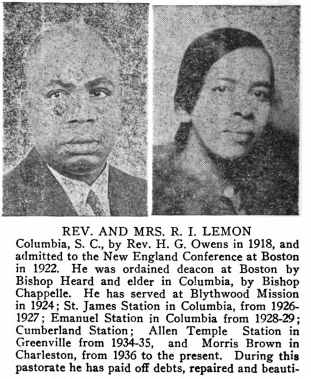 Lemon and his wife, Virginia Vance Lemon, who is my great aunt. I was able to see that they lived in Columbia and moved to Greenville and Charleston. Virginia is someone whom I am definitely interested in learning more about; she is my grandfather’s sister. A study of her life will help reveal more about myself. They moved around a lot just like Rev. Lafayette Franklin Vance. I figured it must be because of Rev. 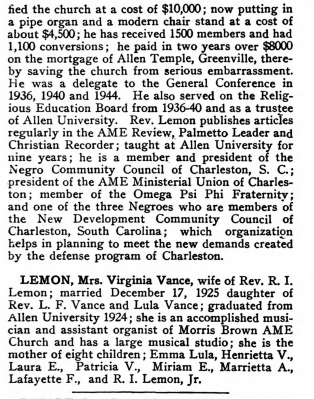 R. I. Lemon’s involvement with the AME Church. If I wanted to learn more about Vivian, I had to trace Rev. Lemon. Maybe there would be a biography on his life among AME records. Lo and behold! I was right! 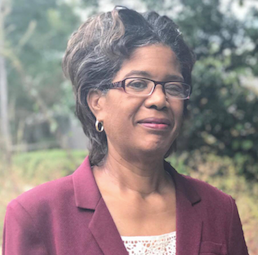 I found The Encyclopedia of the African Methodist Episcopal Church on HaitiTrust. There were entries for Rev. Lemon and Mrs. Vivian Vance Lemon. Now that I have resources the name my great aunt and uncle, I will investigate them further to see what they reveal. I am confident I will find out more, and you can follow along to learn how to access them for yourself. Have you been able to find an ancestor among any of the resources named above? Let us know on our Facebook Group.